It was frustrating, and I bet you know exactly what I’m talking about. After I passed the exam, I started putting together some SPHR study resources that I created to help myself study for, and pass, the SPHR exam. If you are thinking about taking the SPHR, or if you have signed up and you’re staring at that 56% pass rate with more than a little fear, this is the tool for you. I have taken both the PHR and SPHR and understand the differences between the two exams. I have coached hundreds of students over the past five years. I designed this SPHR study tool based on feedback from my students about what does/doesn’t work. The basic format of this program is the Self Study Course I developed several years ago, but I have included multiple strategic, senior level items to make this the only study tool on the market created solely to help you pass the SPHR exam. I just wanted to write a Big Thank You for your helpful tools, tips & guidance in Rock The PHR. I had this info for review in the Fall of 2014. I went in on 12/14 to take my test & passed on the 1st go around. I was SOOOOOOO excited!!!! Thank you for all that you do to assist fellow HR professionals. It is greatly appreciated. I will wear my PHR with Pride. First of all, I passed the PHR last Friday! 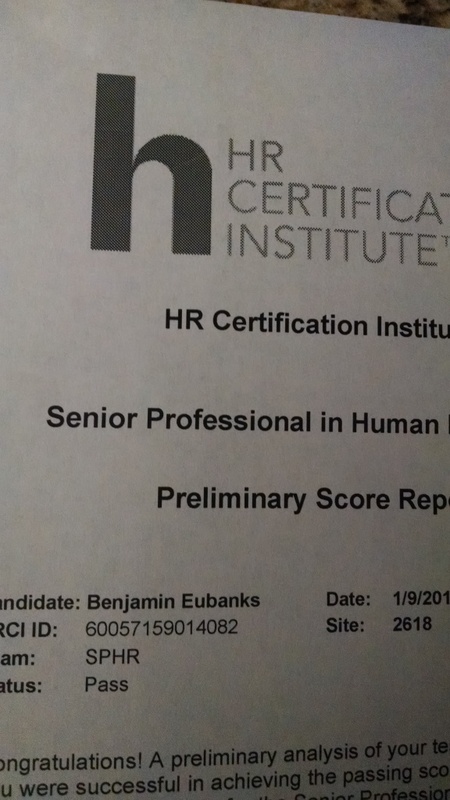 I only have two years of relevant HR experience so passing on my first try was a huge accomplishment (and relief) for me. Your course was very helpful mainly because it kept me on track. I could’ve easily been overwhelmed and not known where to start or how to break down the weeks but the weekly emails, homework assignments and power point really kept me going. I think this is a great tool that I would recommend to anyone. I especially love the fact that it’s cost effective as I am on a tighter budget that some of my peers and did not opt for the SHRM or HRCP learning systems. Passed the PHR first try today. A big thanks goes out to you for your extra effort in helping others reach their goals. From Rock the PHR to your study course, I took in every tip, did my homework, prepared appropriately, and now it’s back to the trenches and continue to make a difference with my company and my team. I really don’t know what I would have done without your guidance regarding all the steps in this process. You were well worth my investment to help me through this process. I have learned a lot from the sample exams, in particular, how to effectively study for the exam. Case studies designed to walk you through realistic business scenarios, offering opportunities to test your understanding of HR strategy, compensation, labor relations, employee development, workforce planning, and risk management. A strategic HR eBook to help you fully grasp the idea of what an HR strategy is and how it ties into business objectives. I had at least six questions on my SPHR exam on this very topic, and at least ten others that touched on it in some way. Video recordings discussing some key SPHR concepts the exam covers. While the HR body of knowledge lists the SPHR topics, it doesn’t shed any light on them or how they plug into the overall business strategy. Plus everything included in the SPHR/PHR Self Study Course ($47 value): a wide variety of lessons delivered straight to your inbox. These 40+ lessons will not only expose you to content you will see on the exam, but they also will help you to stay motivated during the course of your studies–a key reason many people fail to properly prepare. Please note, just like the SPHR/PHR Self Study Course, this is not meant to be a standalone study resource. It is meant to be used in conjunction with another tool (such as HRCP, HR textbooks, etc.) to help you fully prepare for the exam. If this sounds like the kind of program you’ve been looking for, click here to buy now. I wanted to follow up and let you know that your materials are perfect the way they are. I think you said you felt you were failing the test the entire time you were taking it. I had that same feeling. I was 10 questions in and felt like a complete dummy. Remembering that other people felt that way and still passed really calmed me. I just followed all your tips and I got through it! Thanks for the great tips and encouragement with the Rock the PHR exam. I passed the exam today! My name is Amy located in Ohio and I recently obtained my PHR certification. I wanted to extend you a “cyber handshake” for helping me achieve my personal goal! I want to thank you for the self study course (Rock the PHR). I took the exam yesterday, June 1, 2013, and passed! Those are the preliminary scores. The course was really helpful. In preparation for my second attempt PHR exam I subscribed to your HR self study program. I took the exam on January 24th and I am please to say I passed. Your program outline was a great guide to keep me on track. I hope to work with my local SHRM chapter in preparing others for the exam. I will recommend your program! I have less than 12 weeks until my exam date. Can I study in less than 12 weeks? Yes, email me after completing your purchase and I can get you access to all of the lessons so that you don’t miss out on anything simply because you have less than 12 weeks until your exam. What other program should I use in conjunction with your course? I have a partnership with HRCP to allow my students to get a discount on HRCP materials. Information on the discount and HRCP’s offerings can be found here. Why should I spend my money on this? I have been coaching people on how to prepare for, and pass, the exams for more than seven years. I have passed the PHR and SPHR myself. I developed this course after completing my own SPHR certification because I saw the gaps in the existing test prep materials and wanted a way to help people stay motivated and accountable. In addition, the content in the case studies and weekly lessons helps to share some insights learned from someone who has worked in the trenches as an HR leader for years. You don’t get those from a purely academic, textbook-based study plan. I took the SPHR certification last summer missed passing by 5points! my bench prep bundle has expired and I don’t really have the money to be spending another $1k on study materiel (since i work for a govt!). Do your course materiel prepare you for HRCI’s SPHR? Can I use this information to pass the SHRM-SCP exam as well? I just spent like many of the above comments, months and a lot of time, resources, and money studying for the exam, and after 15 questions, realized, that I was not going to pass. I truly felt I had been given the wrong test. None of the materials I had studied was on the test. I truly feel ripped off. Please let me know if this system will help prepare for the SHRM SCP exam as well. I am planning on taking the SPHR as well.